As an oxygen user, I think we’ve all experienced mishaps. I know I’m one of those people. 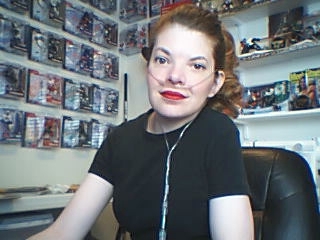 Here is my top 5 things that I don’t want to have happen as an oxygen user. Dropping a highly expensive medicine pill out of the bottle into a wet bathroom sink and it goes down the drain and/or on the floor where a pet could find it. Not good! Taking your diuretic pills and then forgetting that you already took the medicine only to take them again and ending up staying up all night suffering the consequences. If you use liquid oxygen: Having the portable and/or reservoir tank freeze open to spit out liquid oxygen when you absolutely have to go somewhere. While using your oxygen, one side of the nasal prong comes completely separated and not having a spare canula! Having a car mishap (engine trouble) in the middle of nowhere near a pay phone because you realized that you forgot your cellphone. I have had all of these happen to me. My life is full of these fun adventures. What are your top 5? 1. Coming home from a local outing with almost dead batteries in the POC and then having the power go out. I how have a back up system. 2. Thinking you have X hours of battery life in the POC, only to have one of the batteries go complete DEAD. 3. Finding that your wonderful little great nephew turned down the flow rate on the room concentrator. (And you wondered why you were so tired & SOB.) He was 2 at the time. OHMYGOSH! I’ve had your number 3 happened to me too. I wondered what in the world was wrong with me at the time. The child who did this was the same age as your nephew. =o) Thanks for adding to the list of The Top 5! lol! Christine, your #3 always happens when I am in a hurry and portable liquid unit freezes up for some reason and won’t fill. I think it’s the universe’s way of telling me to slow down 😃. Yes, it’s that portable that drives me nuts sometimes. I’ve finally perfected the art of filling my liquid portable. Just stop filling when you see the liquid oxygen start spitting out of the reservoir. lol! Gotta be quick about it! I keep a 75lb reservoir tank in my van to refill my portable as well. 1. When your POC battery is dying and you forgot to bring an extra one with you while at school for a study session and you thought you wouldnt be there that long. Then you car charger and car is across campus. Had to call my mom and have her deliver me another battery to get home. 2. When you are flying home from vacation on your first trip on a plane using oxygen and you POC malfunctions and have to let the stewert know something is wrong. Luckly switching batteries helped make it work. Had to call the company the next day and replace it though. 3. When your oxygen tube catches on everything you walk by. Just have to laugh sometimes lol! 4. When your dogs think your oxygen tube is a leash! And they think they are going on a walk. 5. When the power went out and you have to switch over to the big oxygen tank and it doesn’t work. My brother fixed it half asleep lol! I had to giggle about your number 3! That happens to me too all the time. It’s so frustrating, isn’t it? It’s amazing all the things that can go wrong when on oxygen. So so true Vanessa! haha! This is such a great idea for a post! If you don’t mind, I’ll write my own “top 5” or “top 10” list and post a link to this entry. Glad to see you are safe and full of positivity! 2. Having my liquid portable fall over during a very quiet art lecture at a museum. It made a very loud honking noise which made everyone in the room turn to look! 3. Having the wrong equipment delivered when traveling (this always seem to happen to me). 4. Running out of O2 when driving. Not fun. 5. Trying to convince your oxygen company that their is something wrong with their equipment and they don’t believe you. Cindy, you are spot on with your top 5 list. I had to laugh when I read your # 2. I never knew I could move so fast to pick up my liquid oxygen portable when it falls over. Good grief… It sure screams loudly! Embarrassing! 😉 and your # 5 is soooo true. What a battle! Thank you so much. I was reading all your post . you are inspiring. You are strong person. I am 36 years old who head heart problems. I use oxygen, almost year now. God bless you. Hi Eden… I hoe you are doing better with your oxygen. Thank you for your kind words. *hugs* Stay sting and well.